It’s no secret that Vancouver’s real estate market is red hot. A 22,000 square foot mansion along one of the most sought after streets in Vancouver’s posh Point Grey neighbourhood recently hit the market for $63-million CAD, breaking records for Vancouver’s real estate and making it the second most expensive offering in all of Canada right behind Ontario’s Chelster Hall. 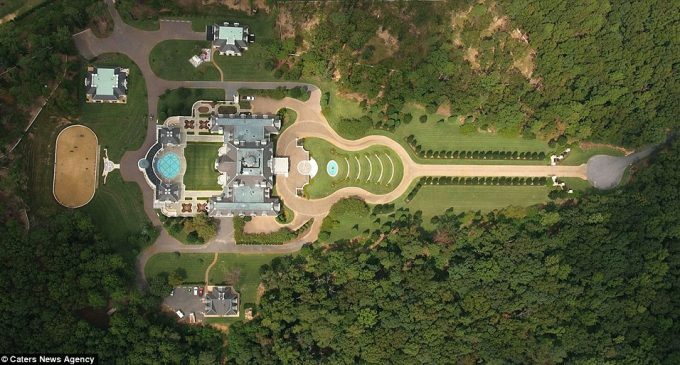 In early-2015, a 25,000 square foot mansion up the road sold for over $51-million. Now, about 18-minutes west of those pricey mansions, an empty 3,100 square foot brick home with roots dating back to c.1935 is taking its turn on the market. It’s listed at $18.8-million CAD, includes 7 bedrooms, 7 bathrooms, landscaped gardens, an open floor plan, an indoor pool, and undeniably beautiful ocean & mountain views. The property was previously on the market for $15.8-million CAD. We decided to search high and low to see what else you could buy with that money. What we found is nothing short of spectacular. Scroll down to see 5 dream estates cheaper than this empty $18.8-million Vancouver home. For $12,900,000 USD ($16,614,555 CAD) you can be the owner of a 21,000 square foot manor inspired by Asheville, North Carolina’s famed Biltmore Estate. The Evergreen, Colorado residence came on the market late last year for $17.5-million and was just reduced to $12.9-million. It’s known as Chateau V and for the last nine years owners Randall and Cynthia Veselka have been creating what was to be their dream home. A community of craftsmen have worked closely with the homeowners and the architect to ensure that each piece of stone, stained and diamond cut glass, wrought iron and the 126 chandeliers were all individually created to suit the Castle’s design. The château sits on about 35-acres with views of the surrounding mountains from nearly every room. See more here. You could save some cash and purchase this incredibly ornate custom residence in Winnetka, Illinois for $11,900,000 USD ($15,326,605 CAD). The manor was designed by world-renowned architect Richard Landry and was put on the market shortly after construction. It was the dream of investment CEO Sherwin Jarol, and wife Deborah, who reportedly sunk over $40-million USD into the construction and originally listed it for $32-million USD. The residence features a show-stopping formal entry, an impressive formal dining room, an elevator, home theatre, spa, winer cellar, 11 fireplaces, and garage space for 10 vehicles. There are a total of 6 bedrooms and 13 bathrooms throughout. See more here. You could have bid on Alabama’s largest private residence, Château Montagel, and nagged it for just $4,800,000 USD ($6,182,160 CAD). The 27-acre Alabama estate was the dream of owner Larry House, who spent over $30-million USD on the property in 1997, with splurges on draperies in excess of $400K, custom rugs costing $400K, and extensive 24K gold leaf accents throughout. There are 15 bedrooms, 24 bathrooms, 12 fireplaces, an attached 12-car garage, mahogany windows & doors, antique pecan hardwood flooring, and two separate 800 square foot cabana houses. Take the commercial grand elevator to the lower level and enjoy the home theatre complete with box office and substantial 17′ x 7′ screen and seating for 25. Also on the property is a world-class equestrian centre with 6-stall barn, enclosed pen, 4 pastures, and a riding arena. See more here. You could buy this spacious 17,500 square foot shingle-style manor on 38-acres with frontage on Lake Macatawa for $9,900,000 USD ($12,750,705 CAD). The home, known as the Hazelbank Estate, originally came on the market in 2013 for $18.9-million USD before being reduced to $11.5-million USD in 2014. Construction began in 1993 with Chicago-based architect and designer John Tilton working with homeowner Holly Palmer, widow of P.T. Cheff, the former president of Holland Furnace Co., and was completed in 1998. The 17,500 square foot home rises four storeys with 5 bedrooms, 7 bathrooms, and a lookout tower overlooking the 38-acre estate complete with stables, pastures, riding trails, an outdoor pool, pond with waterfall, and expanses of manicured lawns. There are 5 wood burning fireplaces throughout, including one in the kitchen with a hearth made from antique Chicago bricks. See more here. You could buy this stunning 21,000 square foot Florida mansion with indoor piazza, commercial theatre, & 6,200 square foot guest house for $12,000,000 USD ($15,455,400 CAD). It was previously listed as much as $14.9-million USD. Sitting on an impressive 7.33-acre estate just 30 minutes from Tampa International Airport is this truly spectacular entertainer’s residence with a main house offering over 21,000 square feet of space and a guest house with an additional 6,200 square feet of space. There are a total of 9 bedrooms & 17 bathrooms throughout. One of the many unique features of this family focused home is “The Village”, a whimsical entertaining wing comprising a movie house with marquee, a pub, a poker and cigar room, loft style music lounge, an ice-cream shop and a book store/library, a space that has never been seen in any other private setting. Straight out of Jurassic Park, the pool has 14 tumbling waterfalls, a lazy river, a rope bridge, a water slide through the mountain and a swim up Tiki bar. See more here.